The scientific mind considers that evolution is a phenomenon without a conscious goal because it is a mindless natural process. There is a pragmatic goal to ensure species’ survival by adapting them to their environment but the whole process is purportedly executed without any conscious decision making. If evolution does not have a conscious goal, it may be surmised that it has no relation with non-material values like morality or universal love. Many biologically oriented scientists think so though social scientists do speak of social and cultural evolution. Proponents of evolutionary humanism suggested that the human moral sense could be considered too as a product of evolutionary change instead of being a faculty imposed by some extra-terrestrial creator! Teilhard de Chardin (1881-1955) favoured evolutionism as signifying the inevitability of progress from the biosphere to the Noosphere – the realm of pure mental consciousness. 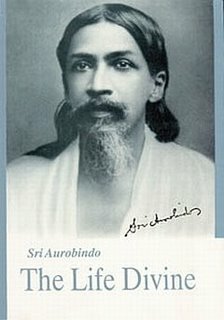 Sri Aurobindo studies evolution along a trajectory of Consciousness where the biological movement is supplemented by a spiritual movement. In the process, all the different schemata of evolution -- scientific, socio-cultural, humanism and evolutionism are located in their proper poises and simultaneously surpassed. Indeed, Chapter XXI of The Life Divine, captioned ‘The Ascent of Life’ deals with the metapsychology of the evolutionary ascent. He starts by acknowledging the mystical and yogic description of Reality in terms of ‘immortality, satisfied delight and omnipotence’ and linking it with the polar opposites of ‘death, hunger and incapacity’ (The Life Divine, pg 213)that we find characterizing Life as we experience it in earth. In doing so, he tries to understand the determinants of ‘the first, the middle and ultimate terms of our evolution’ (Ibid). The first terms of life are divisibility and a dumb, mechanical, physical energy that seems to work automatically. This is the zone of physical science which naturally does not find any ‘consciousness’ in the matrix of Matter. The only puzzle to science is how could such a phenomenon blossom in so short a time after the earth came to existence, a puzzle brushed away by considering it as a ‘freak’ or ‘accident’. However even when evolution proceeds beyond this first stage, the influence of accomplished materialism persists in life, in thought and in the personality. In life, the influence persists in ‘the impotence of an inert subjection to the mechanical forces that govern the interchange between the form and its environment’ (Ibid). In thought, the influence persists in speculating on entropy that studies how randomness gradually declines into disorder. In psychology, the influence persists in the holding to the model of the stable and unique individual separate from every other form and exhibiting a sort of ‘atomic personality’ revolving around the ego. However the materialistic perspective cannot hold fort for long. Firstly, the phenomenon of divisibility cannot proceed ad infinitum. A time comes when subatomic particles, leptons and quarks (the modern atoms) cannot be divided any further because they lapse into formlessness. The line of divisibility when stretched reaches an omnipresent point, a sort of ethereal all-embracing substrate. It is a point where instead of speculating on how things evolve, one has to consider how things manifest. At that point where differentiation can proceed no further, one is forced to consider a return to the undifferentiated unity of Consciousness, qua Consciousness which the mystics and yogis have intuitively realized (Mohrhoff, Ulrich: ‘Spiritual Physics’ in Essays on Sri Aurobindo, Edited by A.Mukhopadhyay,JU,2015). The phenomenon of evolution shifts to a phenomenon of manifestation. The question is whether the manifestation has a purpose, a goal, a meaning unlike the scientist’s perspective of a biological evolution without conscious significance. .
Secondly, the phenomenon of entropy is not final; there is the phenomenon of negentropy whereby things get organized more and more in an orderly fashion. Cybernetics explains how a closed system changes once it is open to information and the disorder of entropy is arrested. Thirdly, one cannot singly survive at the cost of oneself, one can only survive at the cost of the rest of the universe. In other words, one has to expand one’s repertoire of consciousness to include significant others too in one’s ambit of existence. Consciousness therefore comes into the picture despite the skeptic’s denial. The divisible forms lapse into an indivisible, undifferentiated Consciousness very much echoing the Brahman of the Upanishads. The phenomenon of entropy is arrested when a new subset of consciousness in the form of information processing influences a ‘closed’ system. The individual survives when one expands from the individual to the cosmic consciousness. The first terms of life represented in divisibility and physical energy has now to be supplemented by newer terms. The physical energy may not be dumb after all but a result of a ‘force-driven subconscient will’ (The Life Divine, pg.213). It is interesting that Bertrand Russell in his ‘History of Western Philosophy’ (UK: George Allen & Unwin, 1961) commented on modern physics that ‘what burns’ has disappeared. Matter is no longer solid but has become Heraclitean Fire. Dilip Kumar Roy explains in Aurobindonian terms that the Heraclitean “ever-living Fire” is the One Eternal that is the substance or “stuff” (Urstoff) of the universe. (Roy, Dilip Kumar: Sri Aurobindo’s observations on Heraclitus in Essays on Sri Aurobindo, Edited by A.Mukhopadhyay, JU, 2015). Sri Aurobindo explains that this Fire is the outer symbol of a “great burning creative, formative and destructive force”; while the totality of these processes is a constant and unceasing change behind which works a “substantial Will-to-become” (SABCL, Vol.16, pg.343-344). In light of the post-Russell era which acknowledge the formlessness into which the forms lapse resemble a undifferentiated matrix, a Urstoff of consciousness, it is time we also recognize the ‘subconscient will’ in matter as a derivation of some mightier, creative conscious Force. Evolution may not be purposeless after all.